The grey, winter weather doesn’t only contribute to our gloomy moods, but also shortens our list of things to do. But don’t fret, TravelGround always has a solution! We had the great privilege of spending a weekend at the splendid Vrede en Lust Estate, situated in the Cape Winelands between Paarl, Franschhoek and Stellenbosch. 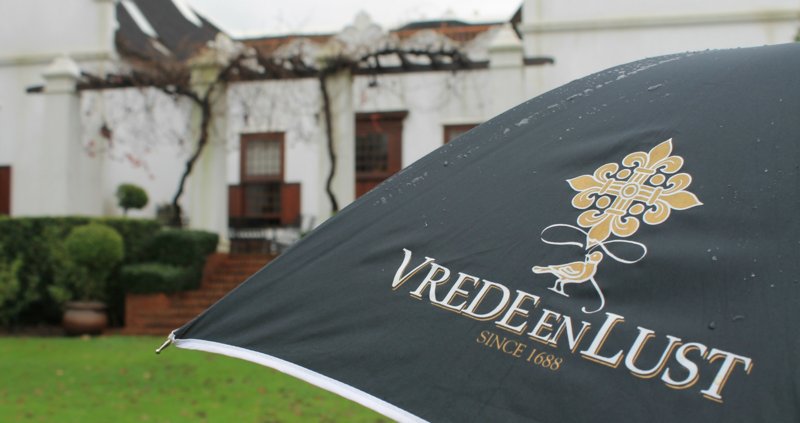 From the get-go we could see it was going to be a cold and rainy weekend ─ the first snow fell in the Western Cape that following Monday ─ but that didn’t stop us from experiencing all that Vrede en Lust has to offer! We arrived on the Saturday morning and Lynne’s warm smile greeted us at our check-in. She took us on a grand tour of the beautiful accommodation around the estate with breathtaking views from every corner, leaving us in amazement. It’s no secret that this estate is filled with centuries of history, revealing a touch of remembrance along the way. Firstly, we visited the great Manor House. The grandeur of the house is luxurious, yet it feels like your own home. The Buys family occupied the house for a few years when they bought the estate in 1996, but it’s now part of the rental accommodation. The Manor House is mainly used as a bridal suite during the wedding high season, and the brides can see their guests arriving from the house. Currently, some renovations are underway to freshen up the house and will be done in time for the start of the high season! Secondly, we walked over to the Jonkmanshuis Cottages, namely Marguerite, Barbère and Jacques, where we stayed at. These cottages were originally built for the three children of the original owner, Jacques de Savoye. The Manor House became too small for the family and he built these additions in time for every child. The cottages are spacious and cosy and has a fireplace to snuggle up in front of ─ perfect on a cold winter’s evening. Lynne then took us on a tour of the newly built Luxury Vineyard Rooms. 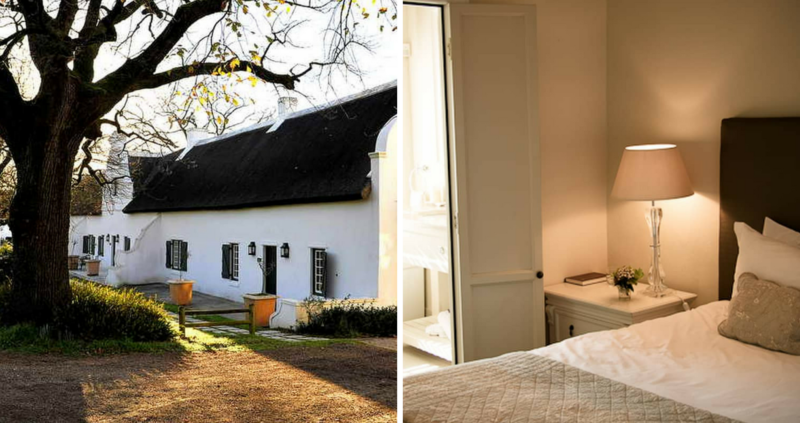 These luxurious rooms are surrounded by vineyards and have a spectacular view of the Simonsberg Mountains. These rooms’ modern design will leave guests feeling relaxed ─ ideal for those seeking a break from everyday life. 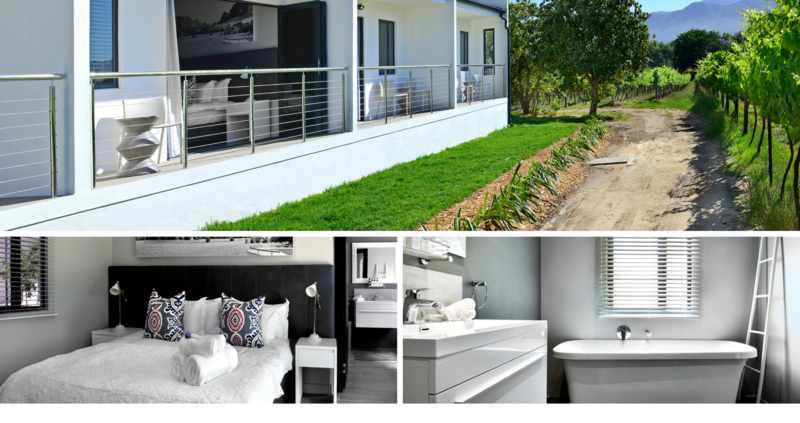 There is one Luxury Vineyard Room fully equipped and accessible for disabled guests. Lastly, we were shown the beautiful conference facilities. Surrounded by stretches of vineyards, the facilities can easily accommodate small or large groups in a relaxing and modern venue with state-of-the-art equipment. 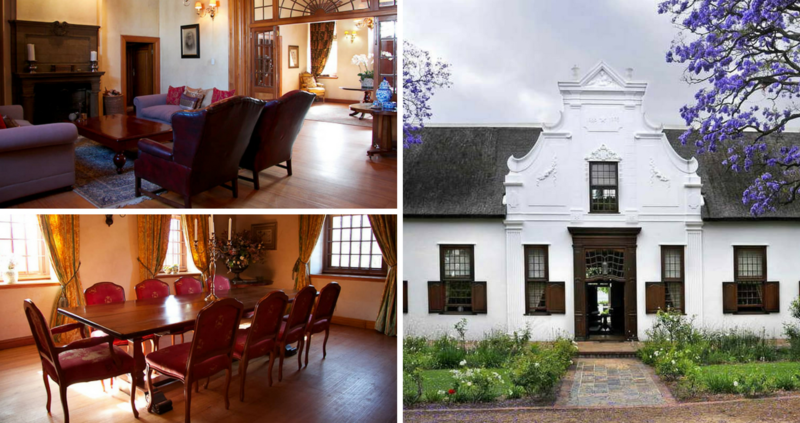 This is one of the few winelands’ establishments that offers accommodation and conference facilities under one roof. 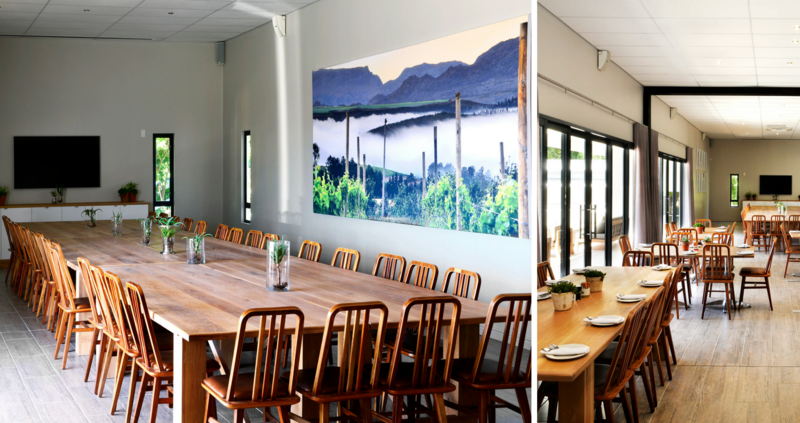 Upon request, Vrede en Lust can also add exciting packages and team-building activities, such as wine-tasting, cycling and boules. The newly renovated Lust recently reopened its doors, and definitely didn’t disappoint. Friendly faces greeted us all around as we entered the warm, earthy and cosy bistro. 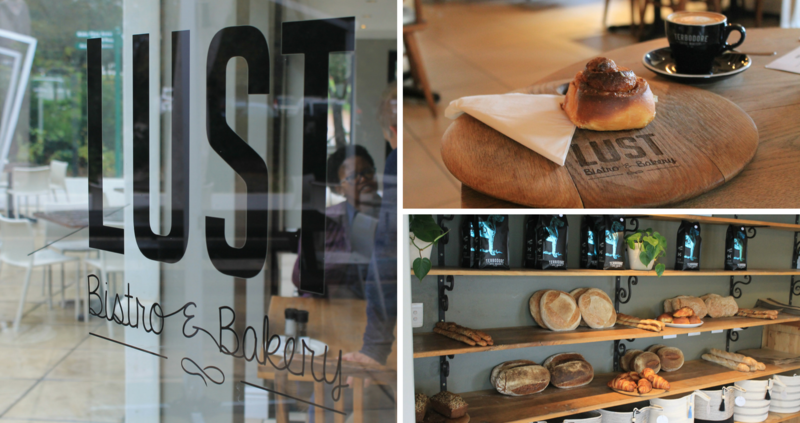 We were delighted to hear all about Lust’s down-to-earth chef, Jean Pierre, his artisan sourdough breads that takes a minimum of three days to make and his simple, fresh food without pretense. We immediately knew we were in for a delicious treat! The bistro has all their baked goods and sweet treats on display, filling the air with heavenly smells. We would highly recommend sitting close to the cosy fireplace on a chilly winter’s day while enjoying a steamy cappuccino and a cinnamon roll. 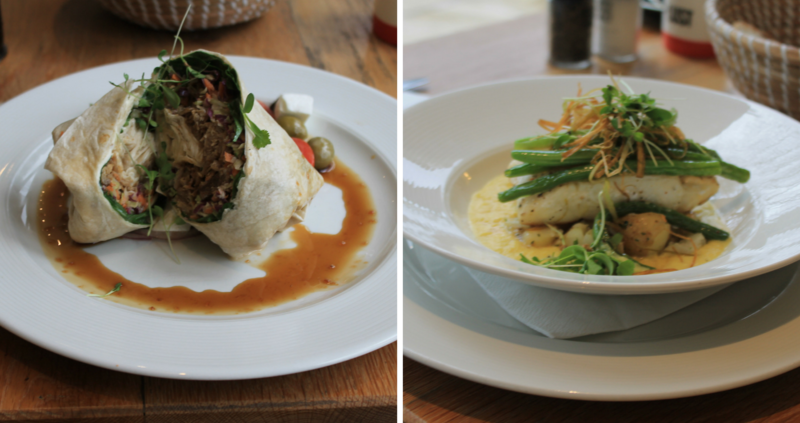 For lunch you should definitely try the mouth-watering pulled pork wrap or the delectable Kingklip dish. Between morning tours, coffee treats and delectable lunches, we were excited about the wine-tasting with Lindt chocolate pairing. Overlooking the winter vineyards and sipping on bubbly prosecco with crackling fireplaces in the background, we enjoyed the knowledgeable introduction to each wine and chocolate pairing with Lourenza. Each chocolate is perfectly paired with a wine, so that when the chocolate melts in your mouth, it doesn’t only compliment the wine, but also enhances certain components in each wine. Vrede en Lust could not only be your dream getaway destination, but also your dream wedding location! Each bridal couple works with a team of wedding coordinators to provide the most memorable day. Each offer includes seating for up to 120 guests, accommodation for up to 40 guests, a picturesque venue and undulating vineyards, a wedding venue enclosed with glass walls, beautiful ceremony and pre-drinks gardens, exclusive use of the wedding venue and accommodation section of the farm by the bridal couple and their guests for the duration of their stay, and amazing catering by Lust Bistro & Bakery. 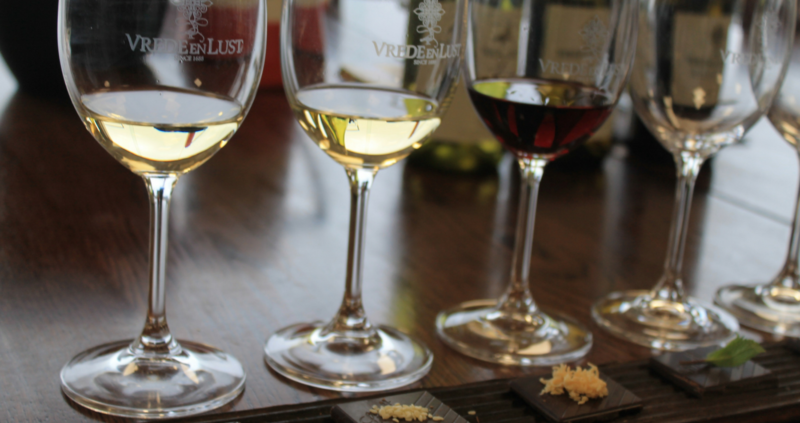 Each element of Vrede en Lust will ensure your picturesque day! Even though the estate has more than enough to keep you busy, it’s also great to take a horse ride along the vineyards and get a full view of the estate. You can even enjoy a glass of wine while exploring the beautiful estate on a carriage. Unfortunately, we couldn’t experience this amazing opportunity first-hand due to the rainy weather keeping humans and horses inside. But we will definitely be back when the weather is sunnier. None the less, we had a lovely chat with Michelle, from Wine Valley Adventures, and it was great to not only hear what they do, but also to see the passion they have for the animals. There are various trails offered at Wine Valley Adventures, such as horse and mule trails, quad bike trails and wacky wine trails. You can even book a wine-tasting trail, dinner trail, champagne-breakfast wagon trail or a wedding carriage for your special day. Wine Valley Adventures definitely has something for everyone to participate in, making this a truly exciting outing for friends and family! Bookings are essential. Thank you to Lize and the team for welcoming us with broad smiles and open arms, and making our weekend at Vrede en Lust one we’ll be talking about for a long time. Do yourself a favour and experience your own winter wonderland weekend on this special estate ─ you won’t regret it!